I often recommend books here on British Tars, but today I'm taking a different tack. Here's a book you should avoid: Martin Dugard's Farther Than Any Man: The Rise and Fall of Captain James Cook. Dugard's premise is solid enough. 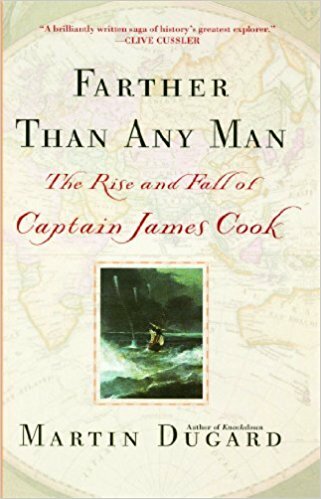 James Cook is a fascinating figure, and his voyages of exploration around the world are the stuff of legends. Sure, there's already plenty of biographies out there about Cook, but another popular history treatment of the man isn't necessarily going to be harmful. I didn't even make it through chapter three. Dugard commits wholeheartedly to myth-making and stereotypes of common sailors. Not once in the brief portion I read does he critically assess the tired tropes he so eagerly parrots, and citations are nonexistent. Some of these are cosmetic, and of only indirect importance to the main subject. He states 'sailors often kept pigtails in place by applying a thin layer of tar. All this gooey, black pitch coating clothes and hair of the era earned the nickname Jack Tar,' and wore 'baggy breeches coated with tar to keep out the wet and cold.' There is no evidence that sailors of the era ever intentionally tarred anything for the purposes of weatherproofing, and it is a well documented fact that until the 1790's, sailors generally wore their hair short. At times, there are puzzling assertions that it would take a simple Google search to disprove. Dugard argues that Cook was 'the first man in Royal Navy history to rise from the bottom of those ranks [common seamen] to an officer's commission and command.' It is true that it was exceptionally difficult for sailors to rise to a commissioned rank, but to say that Cook was the first man to ever do so is either disingenuous or inexcusably ignorant. In other cases, Dugard ignores key facts. At one point, he completed skips the idea that landsmen and ordinary seamen exist, jumping straight to able seamen. This is a very strange omission, and one that can only come from complete ignorance of the subject. It is possible, though unlikely, that Dugard intentionally ignored these classes, as it more readily supports his strange argument that 'real sailors' didn't occupy the lower decks. Not only is Dugard wrong, he is incredibly wrong. It would be impossible to sail a ship with nothing but inexperienced, untrained, and ignorant landsmen. He seems committed to painting the world of the sailor as a terrible and oppressive place, populated by the dregs of society, but isn't committed to doing the research to prove this. When Dugard argues that sailors received an 'annual salary of just one pound sterling,' he's entirely wrong, or perhaps just making it up. For landsmen in the Royal Navy, one of the lowest paid positions one could hold in the Atlantic World, pay was over ten pounds a year. When Dugard is right, it's by mistake. 'Sailors were surprisingly apathetic about God. They put more faith in omens and apparitions.' He's sort of right, but not totally, and for the wrong reasons. It is true that many observers at the time noted 'the only time a sailor began praying was when is his ship was in danger of sinking,' but this is probably due to the sailors' belief that they could still affect their fate. Only once they were in danger that was beyond their control, then they turned to God. To claim they were uniform atheists shows a profound misunderstanding of their world. This kind of ignorance can only come from someone disinterested in their own story, or more interested in writing a novel without the need to develop characters, a plot, and dialogue by masking it as a history. Avoid this book.